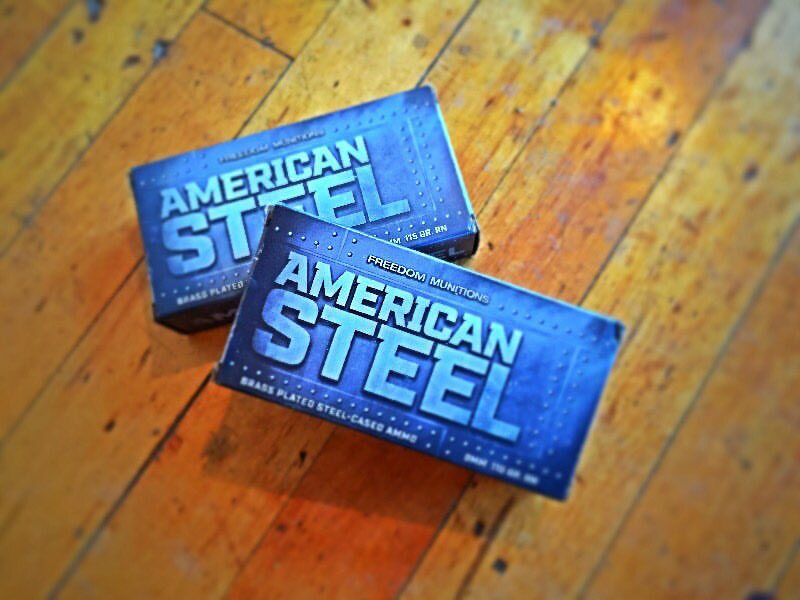 Unlike foreign made and imported steel cased ammunition, American Steel is made from the highest quality brass plated steel cases combined with dependable primers and powder. The American Steel line is not only accurate and reliable ammunition but also offered at a more economical price point than traditional brass cased ammunition; setting a new standard for range ammunition. Featuring a copper plated, lead projectile from X-Treme Bullets, American Steel is loaded to the same performance standards and with the same powder and primers as Freedom Munitions traditional line of new and remanufactured ammunition. Ammo reviews are tricky, especially for ammo like this. The intended purpose is pretty clear: provide quality training/practice ammo for the budget conscious, with a level of quality you’d expect from more expensive ammo. Price point is where you’d want it to be, just north of 10 bucks for a box of 50, and if you buy in bulk you can get that price down to under $10/50. I remember when Wolf 9mm was $9.99 a box, so I’m all about that price point. How does it shoot? Just fine. We ran this through one of the office test M&Ps. Accuracy: just fine, it shot about a 4 inch group at 25 yards with a 4 inch red dot equipped M&P. It feels like it’s loaded light compared to Federal American Eagle, but other shooters with chronos have said it’s not. It’s pretty much exactly what I’d want from my practice ammo: soft shooting, accurate, and reliable. It also throws a shower of sparks out the front of the gun sometimes, which just means you have to yell FREEDOM while you’re shooting. Lastly, there’s one other thing I love about this round. Because the cases are steel, they can’t be reloaded. But they’re brass coated, so they look like regular old reloadable cases. One of my hobbies because I don’t reload is trolling people who do…and this is the perfect round for it. “Oh, I don’t want those empty cases, you can have them.” Mean? Sure. Funny? Hell yes. Looks like reloader will have to add a giant magnet to their tools. I shed no tears. I have had enough annoying experiences with people asking me if they can have my brass that “sympathy for the reloader” isn’t something I posses. The only way piss them off more is if they’re berdan primed. That would be pure evil. Like small primer 45.
re: Because the cases are steel, they can’t be reloaded. The internet, which as we know is never mistaken, says that’s not true. Steel is just harder to re-size and the cases don’t last as many cycles. But that’s if they’re Boxer primed. If they are Berdan primed, reloading becomes much more involved and potentially risky, but there are apparently people doing that too. Okay yes, technically you CAN reload steel cased ammo. But why bother? At $10.00 a box the ROI on the time investment I’d need to make into reloading 9mm is pretty much nil. Overpriced if the price you quoted is realistic; I can get 9mm Brass that indoor ranges allow for a similar price, when buying by the full case and when on sale locally by the individual box (most indoor ranges don’t want you using steel). If you are shooting outdoors, especially at a Free shooting pit, this is a great idea, as then you could use a magnet pickup device to recover your shells and leave the area clean like you should be doing. Hey, if you want to buy brass cased ammo manufactured by child labor in some Eastern European country or with indifferent quality control by hungover South Americans, that’s fine with me. Looking at Freedom’s site, the difference in New brass and new steel is only 10 bucks per 1000. Not as significant of a savings at they’re playing it up to be. Plus, their Reman stuff is 10 or 20 dollars cheaper than this new brass. Is the difference in quality between their new and their reman significant enough to warrant not going with the cheaper reman? Fortunately I am not buying ammo from any of those places you mentioned. And as if there are no hungover/doped up people working in the USA . . . .
You know, you’re getting really tiresome. it works out to 20 cents a round before shipping; new brass cased Blazer is like 23 CPR in bulk. It’s not exactly huge but maybe if you shoot a whole heck of a lot? What’s with all the animosity toward hand loading? I have had more than a couple of annoying encounters with reloaders who basically demanded I give them my brass when they found out I didn’t reload. Well there are assholes in every walk of life. Fortunately, the good guys outnumber the bad. So your response is to give them cases that may cause hundreds of dollars of damage to their gear – and laugh about it? Lighten up, Francis. I’m not giving anyone anything, I don’t give my brass to reloaders. I either recycle it or donate it to the range. If someone is grubbing through the dirt and gets one of these casings that is not my problem. I hope one of them wasn’t me !!! I hope I was not one of them !!! That’s still expensive for 115grn. My 147grn reloads come out to $5.06/50 ($101.12/1k) for 51.50% savings over this. I reload, I have in the past, but I do have to say some reloaders get pushy to the point of rude. Sweeping up your brass while you are still standing there. Like a retiree going for free samples at Costco, they run you over to get their prize. Caleb, I understand donating the brass to the range. I understand recycling it or using it towards purchase credit at x-treme. But I do not understand “not giving anyone, anything” from someone who was requesting kickstarter coin to improve their blog. It’s your brass man. You earned it. I enjoy shooting a lot. I also enjoy hand loading. I have to handload in order to shoot the same volume affordably. We all do not get free ammo to write reviews on. I’ll tell you what – recycle some off your brass my way and I’ll keep referring people to your blog because, you know – karma-. For what it’s worth, I always do 1 of four things with my brass: 1) let the range keep it to do with as they see fit; 2) recycle it; 3) give it to a friend who reloads; 4) collect myself with a delusional plan about reloading. The “not giving anyone anything” comment was addressing the absurd insinuation made that I would intentionally give someone steel cases to jack up their kit. Caleb — Thanks for the info and review. Hopefully I wasn’t one of the “Brass Rats” !!! It’s great to see you back in full troll form. You click bait skills are still a little rusty. If you really want to troll the reloaders try small primer 45acp. I’ve never heard of it happening but I could see how trying to cram a large primer in a small hole could cause quite a fireworks display. I need to take another trip to Wally World. I swear the 100 round value packs of WWB were back down to around $20. Maybe I’m mistaken. Even at $30/100 I’d trust WWB or the Federal economy stuff over Freedom Munitions. I’ve heard way to many horror stories about their reman stuff coming with an added feature that disassembles pistols. P.S. Granted I’ve seen a lot of funky stuff come out of WWB value packs like bullets seated upside down, and a 40 cal bullet squeezed into a 9mm case. I used to get the occasional hang fires with WWB. Not really a true hang fire but a definite delay when running bill drills.